In this issue: Night and demons, popes on the run, and a girl and her treecat—plus the October contest. Springtime in the Eternal City: with uptimer Frank Stone and his wife in the clutches of would-be pope Cardinal Borgia, with the real Pope—Urban VIII—on the run, intrigue is afoot. Now it’s up to the can-do attitude of modern-day Grantville natives thrown back in time to once again escape the clutches of aristocratic skullduggery and ring in freedom for a war-torn continent. A Master Storyteller Delivers Monsters, Grit, and Glory! 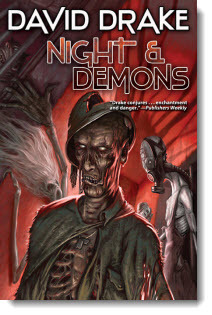 Horrific, weird, and fantastic tales by master storyteller David Drake, creator of best-selling military science fiction. Visit the frightening present and step into alternative histories filled with gritty realism and exacting detail as well as an assortment of horrors and monsters. A Girl, Her Treecat—and a Clan to Save! Fire in the forest—and a cry for help from a desperate alien mother. Stephanie Harrington, teenaged Provisional Forest Ranger on the planet Sphinx, feels the peril and is determined to help. But in the process Stephanie must preserve an important secret from the unscrupulous: the knowledge that the treecats of Sphinx are not merely pets, but are an intelligent species deserving of rights, respect, and freedom. The second entry in a new teen series featuring Honor Harrington’s smart and adventurous ancestor, Stephanie Harrington. For October, we have a special contest in which everyone wins. 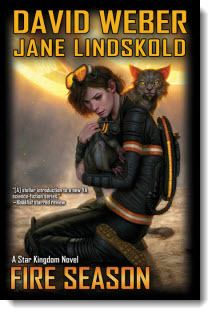 To celebrate the release of Fire Season, the second entry in David Weber’s groundbreaking Star Kingdom series featuring Honor Harrington’s teen ancestor, Stephanie Harrington and her treecat companion Climbs Quickly, Baen Books is pleased to sponsor a special donation drive for Carolina Tiger Rescue. This wonderful organization serves as a refuge for abandoned or abused wild feline carnivores featuring tigers and seven other species of wild cats. Baen Books has entered into a gift-giving partnership with Carolina Tiger Rescue to provide a matching gift for any donation given via a special link provided. That’s right: during the month of October, for every amount you give through the link, Baen Books will match it, dollar-for-dollar. October is Monster Hunter International Month at Planet Baen. Special Larry Correia game gifts, whacks, and special content throughout the month leading up to Halloween! Play the game. Read free ebooks. Play the game. Read some more! It’s springtime in the Eternal City, 1635. Uptimer Frank Stone and his pregnant downtime wife are in the clutches of would-be Pope Cardinal Borgia, with the real Pope—Urban VIII—on the run. It’s up to the doughty natives of time-tossed Grantville, West Virginia, to save the pope and continue the fight for freedom in a dark age. 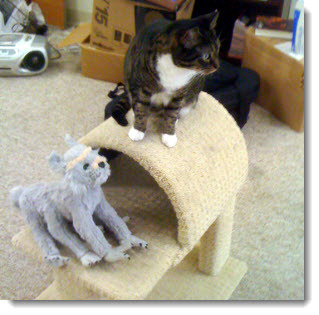 Baen plush toy treecat Nimitz and Baen office real cat Nanotchka excited about the October Fire Season Charity Drive with Carolina Tiger Rescue. For the September contest, we asked readers to tell us who they would send back to 1635 to be pope in order to usher in an early Enlightenment. We received some wonderfully intriguing and deranged entries in response. Our co-winners are Vanessa Landry and David Ruzicka. 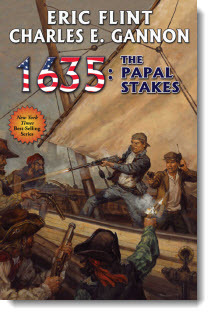 Vanessa and David will each receive a signed hardcover of 1635: The Papal Stakes and five free ebooks. Don't forget to check out a new series of interviews with David Weber--from Poland! Plus, commentary on an Honor Harrington movie here. 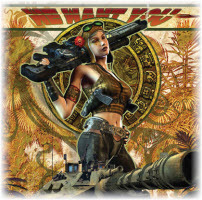 Don't forget to check out the latest Ebook releases here, as well as Baen.com free fiction from Charles E. Gannon, coauthor of 1635: The Papal Stakes, here as well as When Diplomacy Fails author Michael Z. Williamson’s take on guns and media representation (and misrepresentation) here.